The best practices for standpipe and hose systems have changed. 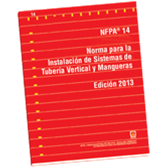 The 2013 Spanish edition of NFPA 14 is vital for fire protection professionals. New established clearance around hose valve handles helps ensure fire fighters wearing gloves can operate the valve without difficulty. Added requirements for heat tracing and new guidance with respect to "supervised"
Fully revised requirements for drains and main drains clarify their intended function, purpose, and installation.